The Danish National Research Foundation has awarded a $5 million Niels Bohr Professorship to Enrico Ramirez-Ruiz, professor and chair of astronomy and astrophysics at UC Santa Cruz. Ramirez-Ruiz is one of seven international scholars selected this year for the Niels Bohr Professorship Program, which aims to attract top international researchers to Danish Universities. 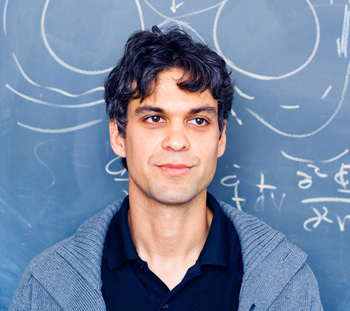 The five-year award will support an international research collaboration in theoretical astrophysics led by Ramirez-Ruiz, who will divide his time between UC Santa Cruz and the Niels Bohr Institute (NBI) at the University of Copenhagen. The collaborative program, called the NBI Center for Transient Astrophysics, will focus on the physics of transient astronomical phenomena such as exploding stars and gamma-ray bursts. Astronomers are greatly expanding their capacity to detect and observe such transient phenomena through large survey projects. Ramirez-Ruiz has been working to develop the theoretical framework needed to interpret observations of astronomical transients and maximize the scientific yield of large survey projects. At the University of Copenhagen, he will work with Professor Jens Hjorth, director of the Dark Cosmology Centre at NBI. Ramirez-Ruiz, a long-term associate at the center, was named affiliated professor of high energy astrophysics at NBI in 2014, and he has organized workshops and co-advises graduate students and postdocs at NBI. "Enrico Ramirez-Ruiz is really an internationally renowned top scientist, and his research fits in perfectly with our research in the Dark Cosmology Centre," Hjorth said. "He primarily researches violent phenomena in the universe such as exploding supernovae, bursts of gamma radiation, black holes in the centers of galaxies, and other phenomena that change over time. He is a theorist and studies the phenomena using computer simulations, while a large part of our work is based on observations using both space telescopes and large, ground-based telescopes." Both observations and theoretical calculations are necessary to advance the understanding of transient phenomena, and the NBI Center for Transient Astrophysics aims to build a strong community of theorists and observers. Hjorth and Ramirez-Ruiz have already engaged a core group of internationally acclaimed scientists and partner institutions committed to this endeavor. "The center will create a collaborative theoretical and interpretive environment tied closely to the ongoing surveys," Ramirez-Ruiz said. "We will support and train graduate students and postdoctoral researchers in an environment where exciting discoveries are occurring at a rapid pace." He noted that transient objects have always played a crucial role in the development of astronomy and in the use of astronomical observations to illuminate new physics. The new center will address important long-standing problems in astrophysics, including how stars explode as supernovae and gamma-ray bursts; how stars end their lives and become compact objects such as white dwarfs, neutron stars, and black holes; how black holes grow in mass by ripping apart orbiting stars and swallowing the stellar debris; and what happens when two compact objects merge. "These exotic and transient phenomena are spectacular probes of extreme physics at high energy and high density, and they are ideal test-beds for theories such as general relativity and alternative theories of gravity," Ramirez-Ruiz said. His appointment as a Niels Bohr Professor will take effect in fall 2016. Ramirez-Ruiz is the second UC Santa Cruz professor to win a Niels Bohr Professorship. Anthropology professor Anna Tsing was awarded one in 2013, the first social scientist to be honored by the Danish National Research Foundaton.